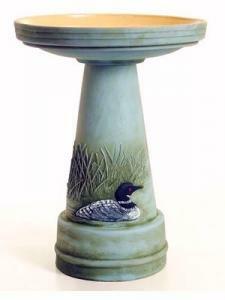 Hand Painted Great Northern Loon Bird Bath with Lock on Design is a best seller. Skilled artisans use meticulous care when recreating this bird bath, delicately decorated with a loon motif. Loons are one of America's favorite waterfowl. You'll be proud to display this stunning bath in your own backyard! Interior of the bowl is glazed in a contrasting yellow. A USA company renowned for their high-quality stoneware and designs since 1933. You'll love the beauty and quality every time you see it. The lock-on design ensures the basin will never fall off the base. Basin is 16-1/2 inches in diameter, the pedestal is 21-1/2 inches high. Do not allow to freeze, not recommended for use with a heater. A Wisconsin and Minnesota favorite birdbath.